[XPB-BXXPL-X] The Standard Perforated Athletic Player's Bench is constructed entirely of Heavy Duty steel with cast iron legs and pre-drilled mounting holes. Standard player team sports benches are coated in Thermoplastic, a durable weather resistant coating, and available in in 16 color choices (See Color Selects). 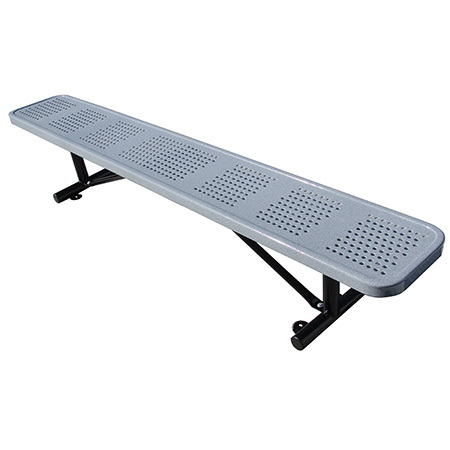 Perforated bench is 15" Wide and available in choice of 6 ft., 8 ft., 10 ft. and 15 ft. lengths and Portable, In-Ground and Surface Mount installation. Compliment your bench with a matching receptacle sold separately. For shipping quotes, discount pricing, orders or questions please call our Customer Service Center at 1-877-483-9270.